Adding a contest or promotion to your golf tournament is an easy way to make your golf event more exciting as well as a fantastic way to raise additional money for any cause. That’s because every golf contest represents an opportunity to sell additional golf tournament sponsorships as well as signage. Here are a few of our most popular golf tournament fundraising ideas. 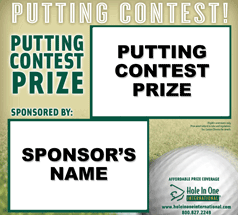 Used frequently as fundraisers at charitable, corporate and golf course tournaments a hole in one contest gives tournament participants the chance to win a valuable prize for making the perfect shot, a hole-in-one. Premiums start from $150, and we guarantee the best rates in the industry! Before, during, or after your tournament, a single or three-putt combination putting contest is a surefire way to create excitement for all your participants; after all, anyone can make a putt! Odds On offers both indoor and outdoor putting contests. Looking for a great fundraising idea that will draw a crowd? A million-dollar golf shoot-out is always a crowd pleaser. For as little as $190, you can advertise your tournament as "A Chance to Win $1,000,000" while giving players the chance to walk away a millionaire. 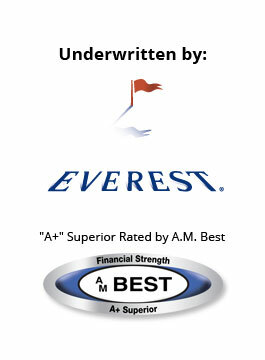 A golf ball drop is a fun and effective fundraising add-on for any golf tournament. First step is to sell as many numbered golf balls as possible. How much you plan to charge per ball or per ‘group’ of balls is strictly up to you! The numbered balls are then dropped onto a designated target from a cherry-picker, net, helicopter–or even, a hot air balloon! If any of the balls that land closest to or inside your target zone matches one of a series of preselected numbers, the owner of the lucky ball will win your grand prize, which can be insured up to $1,000,000. Looking for a unique promotion that will add big excitement to your post-tournament banquet, can easily by customized to suit your organization, location, and budget, all while giving you the opportunity to sell a few more sponsorships? Check out Odds On’s Lucky Envelope promotions where if a lucky participant can locate a winning combination of prize symbols, they win your grand prize, and Odds On will write the check. Make the most of your event by pairing the Lucky Envelopes game with an attention-getting game board, which can be fully customized to suit your event.